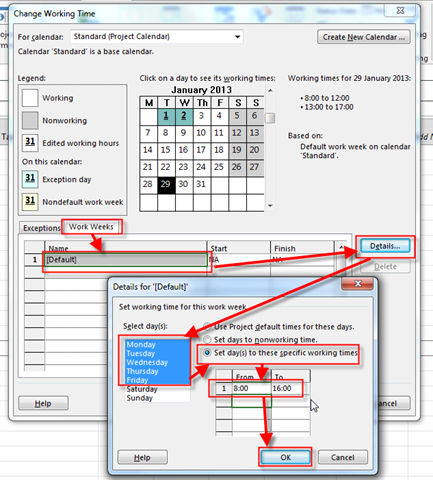 How to make modified Calendar default for future Projects in MS PROJECT 2013! Let me show you how can you accomplish that! 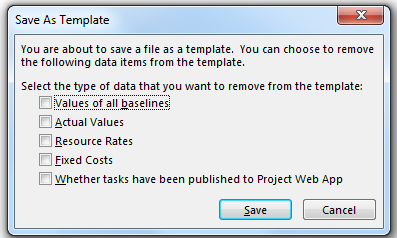 Here I can choose which Values is not going to be saved in my template! 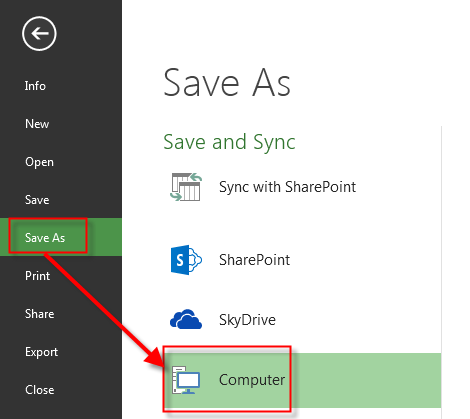 I will choose all of them, and I will click Save button! 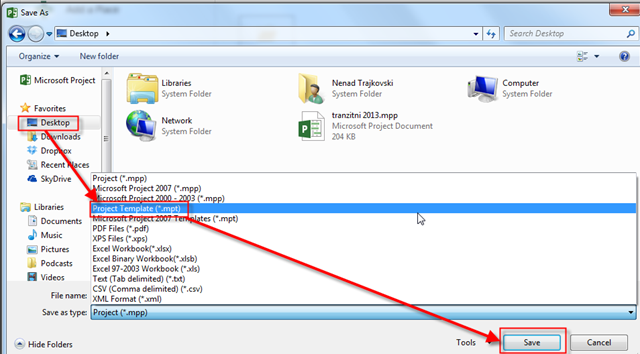 As you can see this task will start on Tuesday, 29.1.2013, and it will be Finished at Tuesday 5.2.2013. Why? Because I set 01.02. (Friday) as non working day, so task will be performed at Tuesday, Wednesday, Thursday, Monday, and Tuesday! And one important thing. 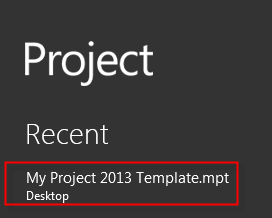 When you save your Project created from Template, save it as a Project (.mpp file), not as a Template again! This entry was posted in MICROSOFT PROJECT, Microsoft Project 2013, PMI, PRoject Management and tagged Microsoft Project 2013, MS - Calendars, MS PROJECT, MS PROJECT 2013. Bookmark the permalink. 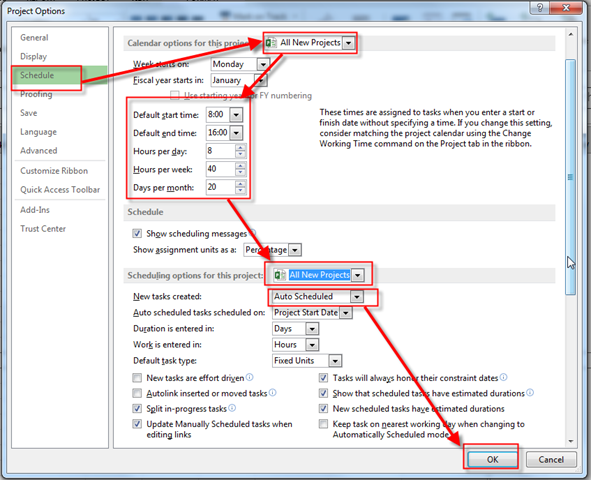 8 Responses to How to make modified Calendar default for future Projects in MS PROJECT 2013! Thank you for an informative blog post! 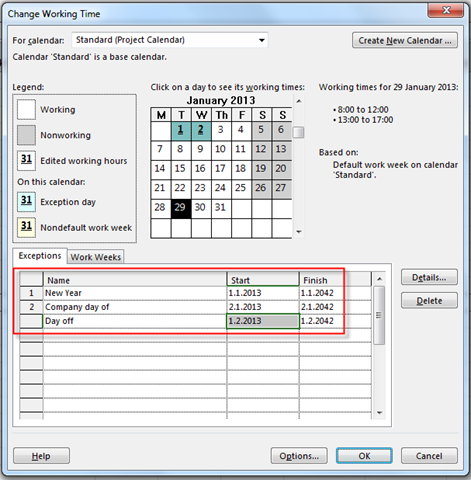 The other way is to open one blank project only, modify the Standard Calendar to include local holidays etc. 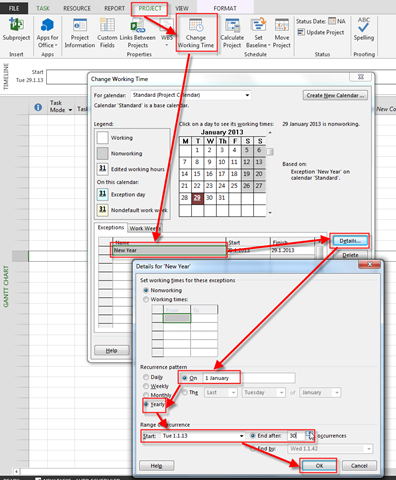 or whatever you want your standard calendar to contain, then go to File > Organise > Calendar tab and move the modified Standard calendar into your Global.MPT template. It replaces the Global standard with the new one you just created. This was super helpful! One question though – if you create a template, then make changes to the calendar in the future (resource vacation days, added holidays, office closings, etc.) will the projects created off of that template automatically be updated with the new working days, or will you have to adjust each individual project? No it will not! Once you created Project from Template and save it it is not connected to template any more! Thanks for the information! I will try this in some of my projects. Same way as in PROJECT 2013. Save the Template and that’s it!